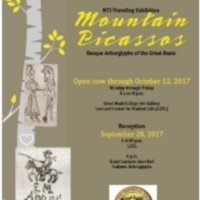 Advertising poster for the "Mountain Picassos: Basque Arborglyphs of the Great Basin" exhibit at the GBC Art Gallery from August through 12 October 2017. The poster also advertises the reception and talk on 28 September 2017 by Jean Earl. 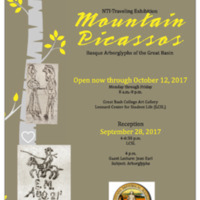 The event was co-sponsored by NTI, Nevada Humanities, the Nevada Historical Society, the Nevada Arts Council, and the National Endowment for the Arts. Copyright © 2016, Great Basin College. All rights reserved. 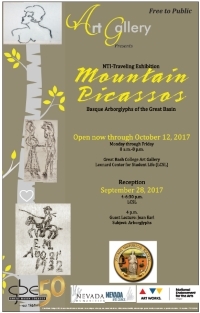 GBC Media Services, “Mountain Picassos: Basque Arborglyphs of the Great Basin poster,” Digital Humanities of the Great Basin at Great Basin College, accessed April 25, 2019, https://humanities.gbcnv.edu/omeka/items/show/412.